Apple introduced yesterday plenty of services, while Huawei is unveiling the P30 lineup today. Although the timeline appears to be a coincidence, Huawei Ireland did not hold back and decided to throw shade at Cupertino and tweeted “Thanks for the warm up Tim” with the actual punctuation errors. Although some might find the tweet funny, commenters below immediately went into hivemind mentality and started attacking the Chinese phone manufacturer, including highlighting the fact that the company CFO Meng Wanzhou had three Apple products on herself at the time of arrest. Others also took the time to highlight that Huawei tried to add an Apple-esque touch to its promos, including the similarities between the latest Matebook X Pro marketing campaign and any Macbook promotion ever. 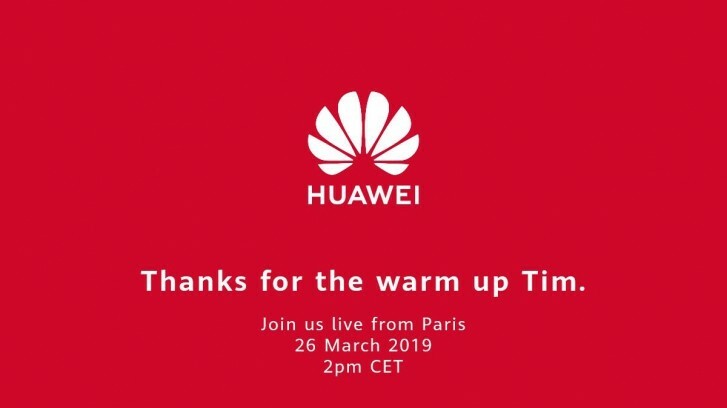 The Huawei P30 launch will take place today at 2 PM CET in Paris. We are in the French capital to cover the event, and once everything is official, we will let you know.